Watopia route fixes/additions: the routing for the “Figure 8” route, which was broken in the previous release, has been fixed. The Pretzel and Mountain 8 routes have been modified and should be routing consistently now. Route options previously named “Prefer Hilly” and “Prefer Flat” have been updated to Hilly Route and Flat Route respectively. Lastly, a “Mountain Route” option has been added which takes you out the mountain road to the top of the tower climb then back through the start/finish, making it perfect for races and group rides that want to include a hard climb. 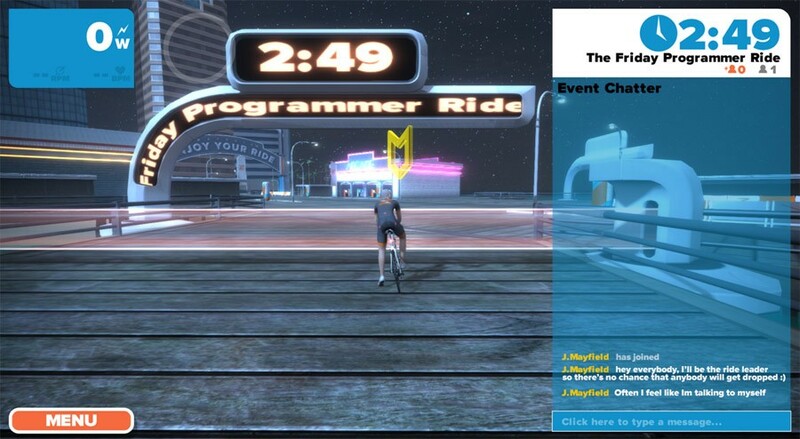 Name change bug fix: probably the longest-standing bug in Zwift history, it’s with some sadness that we bid it adieu. Previously if you changed your name in-game everyone else saw the change except for you, until you logged out and back in. Now you’ll see the change immediately. Ride on! The big announcement here is the next phase of the group ride features being rolled out. The initial phase of the features, rolled out a couple months ago, made it easier to see the group ride leaders by putting a beacon over their head and an indicator next to their name in the rider list. In this second phase, Zwifters will be able to join official group rides which will stage out of the carnival/staging area. Lead developer Jon Mayfield gives a lot of detail in his post on this subject, so I’ll simply link to that post for more info.